Since there's very little happening on the internet today, we thought we'd give you a Holiday Gift! We recently stumbled across talented artist Matthew Meyer's blog where he posts his original art work regularly. We became quite intrigued with his depictions of Japanese Yokai. Yokai are a class of super-natural monsters in Japanese Folklore and there are many, many of them in all kinds of forms, but the one that caught our eye today was the Nurikabe. It's at once a little comical and also frightening. We'll let you read Matthew's description of it below, and when you finish, check out his Yokai-a-day series, which he does every October in honor of Halloween. You can also go to his other site Yokai.com where he's creating an illustrated database of the yokai and read about the Nurikabe there as well. It's fair to say he's an expert on yokai as he is currently living in Japan researching them extensively and we're hoping he might be a guest on the show at some point. When you're done, if you like this stuff, check out Matt's book The Night Parade of One Hundred Demons, with original illustrations and background on them. In 2015, he's self-publishing a crowd-funded sequel via Amazon entitled, The Hour of Meeting Evil Spirits which will feature 125 new yokai, including the Nurikabe. Here's Matthew's original blog entry, a link to his Facebook page, and Twitter account as well. Today’s yokai is extremely well-known and popular in Japan, made famous by Mizuki Shigeru’s yokai stories. However, like many of Mizuki’s works, it has its history way back in the ghost stories of the Edo period. If we look back at the original monster scroll paintings that started the whole Edo period yokai mania, we’ll find that nurikabe has changed quite a bit from his original form to the cute character most people know today. Many yokai have changed such, and their original forms were much scarier or more grotesque. Nurikabe means “lacquered wall” and also the word for a plaster wall today. It comes from coastal regions of Japan, and was originally an invisible, wall-like manifestation that blocked people from walking late at night. Like most other invisible yokai, it was given a spectacular form by imaginative painters, and since then it has been depicted in various styles. One of the most famous depictions of a nurikabe comes from a scroll by Kanō Tōrin Yoshinobu painted in 1802. 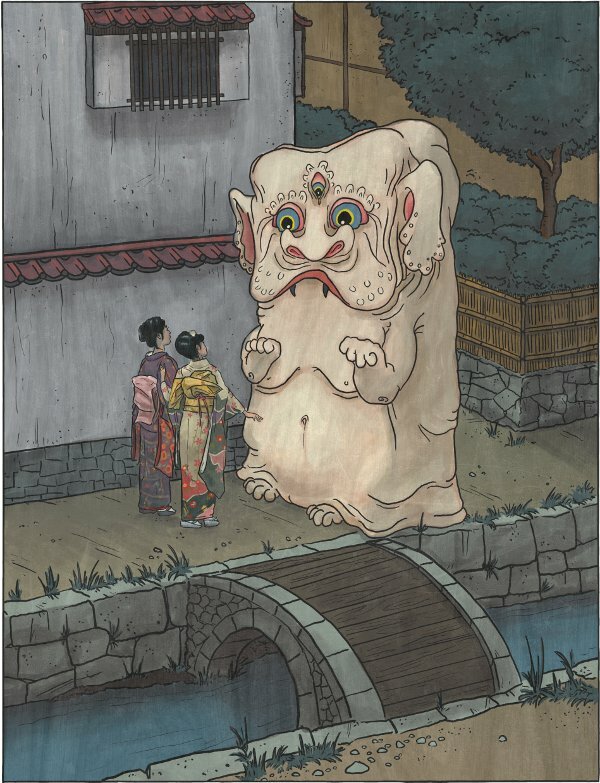 I think his nurikabe looks kind of like a mix between an elephant and the luck dragon from The NeverEnding Story… Others have painted him as simply a broad face on the surface of a house’s wall, almost like a kind of wall tsukumogami. Nurikabe appear on roads late at night. As you are walking, right before your eyes, an enormous, invisible wall materializes and blocks your way. There is no way around it, as it extends as far as you can go to the left and right. There is no way over it, and it cannot be knocked down either. However, it is said that if you tap it near the ground with a stick, it will vanish, allowing you to continue on your way. Are you interested in yokai? Can’t get enough of strange Japanese culture? Then you should check out Matthew's book, The Night Parade of One Hundred Demons, on Amazon.com and learn the story behind over one hundred of these bizarre monsters!